BareFaced Beauty is a UK based mineral makeup company. They have a range of mineral products such as their award winning mineral foundation which is available in 14 shades which costs £12 (3-4 months supply). They also have a range of brushes, lipglosses, mineral bronzers, eyeshadows and blushers. Today I will be reviewing 2 of their mineral eyeshadows, a lipgloss and their Pump Actioned Dispensing brush which is so exciting! This brush is currently featured in the latest copy of Vogue ( Dec ) so this is majorly hot right now! The brush is a handy size and is great for carrying around with you to touch up your make-up. Especially if you're leaving work to attend christmas parties then this is a must. The brush is super soft and not at all what I expected, made with 100% synthetic bristles. The brush measures 16.5cm long and 2.4cm in diameter and costs £14.00. You can fill the brush with your foundation, bronzer or blusher. I have filled mine with a mineral foundation and have been carrying this around with me and with a small press of the button I can refresh my foundation with a light application of product. It is a little fiddly to begin with, I used a small teaspoon to fill my brush up but it's well worth it. I think once my foundation is used up I will fill this with a shimmer dusting powder because I can use it for my face but also for my body which would great for the festive season! I had so much fun experimenting with these shimmery eyeshadows, Tigers Eye and Blue Moonstone. I used Blue Moonstone all over my lid and then applied Tigers eye softly in the socket adding depth. I then experimented with Tigers Eye and tapped some powder into the lid and with an eyeliner brush and a drop of water I made an eyeliner. 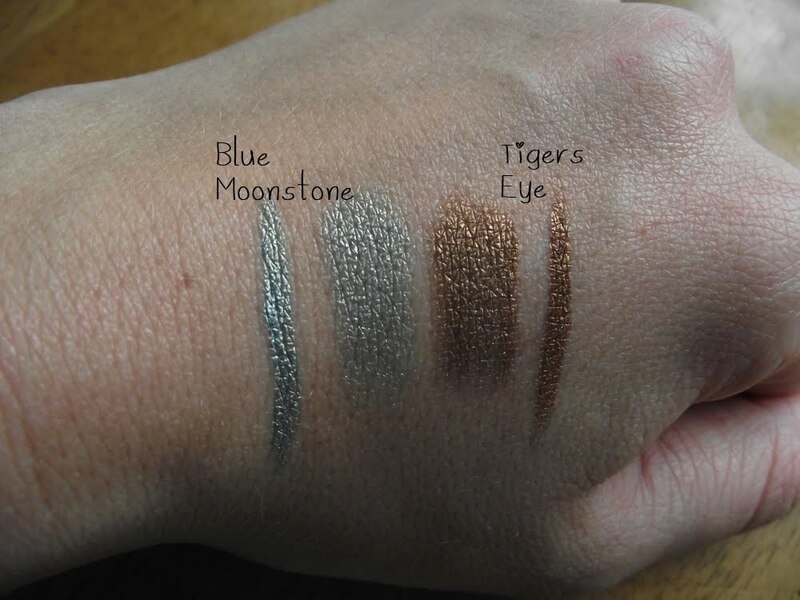 The eyeshadow looks so different from the wet liner when seen on the eye but when you see the swatches they look the same. Lipglosses for me really finish off a look especially if your going out for the evening. During the day I often wear a gloss for an instant perk me up. For the evening applying a gloss over the top of your lipstick not only brightens the lip area but also helps your lipstick last longer. It's all about layering. When I was sent one of their natural lipglosses in Juicy Peach I was a happy chappy. Peach and nudes are my favourite shades. There are another six shades to choose from, they are so pretty and sparkly and not too sticky which is a bonus. Here is a pic showing you my FOTD using the brush with my normal foundation in, the 2 eyeshadows and the Juicy Peach natural lipgloss. If your stuck for christmas ideas then check out their christmas kits for inspiration here. I've been on the lookout for a good mineral foundation for AGES now (been using a light dusting of maybellines mineral foundation over my usual liquid product) and this brand looks fantastic!